The talus bone of the ankle is commonly known as the ankle bone. It transfers weight-bearing from the shin to the foot and has the highest percentage of surface area covered by cartilage in the human body. Unlike most bones, no muscles attach to the talus and its position depends on that of the neighboring bones. Osteochondral lesion of the talus, (cartilage damage of the ankle) can occur from a traumatic fracture or ankle sprain, when the bones in the ankle joint hit each other damaging the cartilage surface. The initial pain may resolve, but the pain often comes back during exercise, with possible locking of the joint. 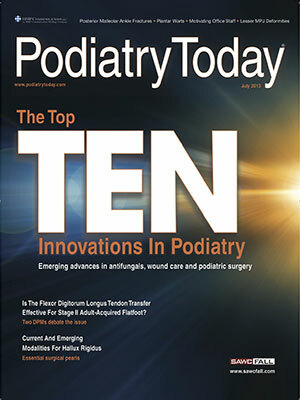 The University Foot and Ankle Institute is one of the top foot and ankle centers in the world. Our doctors and surgeons are recognized for providing treatment of large osteochondral lesions of the talus with removal or fresh transplant. 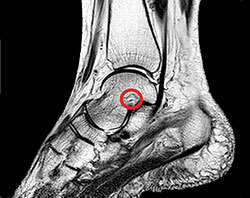 The diagnosis of cartilage damage (osteochondral lesion, also known as talar dome) is often done with x-rays and/or an MRI. Initial x-rays are taken to check the alignment of the foot and ankle, as well as look for any bone damage. With an MRI, the ligament structures, tendons and cartilage of the ankle can be examined and analyzed. Depending on the extent of the cartilage damage, treatment options may include arthroscopic removal of the damaged cartilage and drilling of the damaged region prompting the growth of new cartilage called fibrocartilage. If the lesion is large or involves the deep bone below the cartilage-damaged area, a transplant of fresh bone and cartilage, either from the patient’s knee or from a lab, is placed as a plug into the injured region. BioCartilage is a revolutionary product that results in a stronger ankle joint, faster recovery and reduced chance of re-injury than with traditional methods. Read more about BioCartilage here. Because the talus bone lacks a strong blood supply, healing a broken talus can take longer than most bones. Patients recovering from a broken talus may not be able to walk for several months without crutches, after which they will likely wear a walking cast or boot for a length of time. Each surgery option can be performed at one of our nine Southern California locations, where every patient is treated for their specific situation.